The WeHo Planning Commission’s design review subcommittee will review on Thursday the proposed design for the Arts Club on Sunset Boulevard. The club building will replace the building on the southeast corner of Sunset and Hilldale Avenue that now houses the Hustler store and various offices, including that of the Gay Men’s Chorus of Los Angeles. The nine-story building is designed by the Gensler architecture firm. 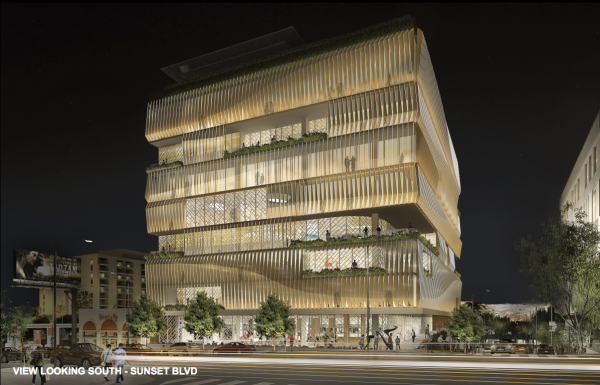 Gwynne Pugh, whose architecture and design firm has been engaged by the City of West Hollywood to evaluate proposed new buildings, praised the overall design. “Overall, the design of the building is favorable, both as an urban and architectural landmark,” Pugh said in a memorandum to the design review subcommittee. Pugh’s review suggested the building include planters as a buffer on the terraces of its higher floors to restrict the view from there into the apartments and houses in the neighborhood behind the building. Pugh also suggested the architect limit the light projected onto the residential area from the building’s façade. As designed, the building would offer an underground parking garage accessed from Hilldale Avenue that would be automated, with cars automatically retrieved and parked from the Hilldale entrance. The first floor would accommodate a retail space and a public art gallery. Floors two through four would house offices for creative businesses. The remainder of the building would be used by the Arts Club. There would be a spa/gym/wellness center on the fifth floor with an open-air dining terrace and screening rooms. The sixth floor would house 15 guest rooms. On the seventh floor, there would be a drawing room and brasserie with a terrace as well as a members lounge. The eighth floor would house a restaurant. The building would be topped by a terrace and swimming pool on the ninth floor. There also would be a helipad for emergency use. Overall, the building would contain 132,000 square feet of space, more than seven times the size of the existing Hustler building. The developer is asking the city to grant an amendment to its General Plan because the southern portion of the property sits in an area zoned only for high-density residential use. The amendment also would be needed to permit the proposed nine-story height. The developer also is asking the city to allow it to add only 220 parking space, fewer than current regulations would require. The Arts Club would be the North American branch if the famous London Arts Club, which is housed in an elegant 18th Century townhouse in that city’s Mayfair district. The members-only club was founded in 1863 by a group that included Charles Dickens and Anthony Trollope. The West Hollywood club’s backers include Gwyneth Paltrow, the actress, who is a member of the London Club. To become a member one must be nominated by an existing member and participate in or have an interest in art, literature or science. The London club’s annual dues are £2,000 or roughly $2,880. The design review subcommittee will meet at 5:30 p.m. Thursday in Room 5 of the Plummer Park Community Center, 7377 Santa Monica Blvd. at Martel. This is a total eye sore and way too big for that site. More congestion. less parking, bright lights. West Hollywood you are ruining this city!! 1. “Arts-Club” sounds very chic and representing weho’s history. 5. ASKING FOR the CITY to ALLOW FEWER PARKING than Zoning Requires. WILL THE PLANNING COMMISSION BE BENT OVER TAKING IT UP THE BACK SIDE WHITE GIVING A SUPER RICH PRIVATE CLUB SO MANY ZONING CHANGES? Well I guess one thing we should be thankful for is at least there isn’t another billboard on the side of the building. Just kind of sad. I remember when this was Blockbuster. And even the Hustler Store was a nod to the past. Now it will just be another extension of Beverly Hills wealth. Nothing says ROCK AND ROLL like a glowing off-white box. BUT are there enough parking spaces, some for public access too? Is there any greenery, and how about setback from the street to combat congestion? So comforting to know that West Hollywood is becoming an exclusive city for the rich at an ever accelerated pace..
Bye, bye West Hollywood welcome to downtown LA. The giant eraser is upon us.